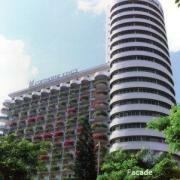 The 20-storey air-conditioned hotel offers 314 rooms including 144 deluxe rooms, all of which have a city view. The foyer is decorated with tapestries and valuable antiques, set against a marbled floor and black granite walls. The Princess Terrace, famous for its Penang Buffet, and the Tien Court Chinese Restaurant are available for guests. The colourful lounge features a 2.75m television screen and regular live entertainment. Copthorne King's Hotel is ideally located in the city centre by the historical Singapore river with easy access to major expressways and the Mass Rapid Transit. Close to the business and exhibitions districts of Shenton Way, World Trade Centre / Suntec City and the shopping & entertainment circuit of Orchard Road, Chinatown, Clarke Quay, Boat Quay and Robertson Quay.